(1) I have told you more than I know about osteoporosis. (2) What I have told you is subject to change without notice. (3) I hope I raised more questions than I have given answers. (4) In any case, as usual, a lot more work is necessary. Conclusion of one of his papers. In Barry G. Firkin, Judith A. Whitworth, Dictionary of Medical Eponyms (1996), 5. Dilbert: I’m obsessed with inventing a perpetual motion machine. Most scientists think it's impossible, but I have something they don’t. Dogbert: A lot of spare time? Dilbert cartoon strip (8 Aug 1991). They are not chemists there, just a lot of paper hangers. Quoted in 'Alexander Robertus Todd, O.M., Baron Todd of Trumpington', obituary by Damiel M. Brown and Hans Kornberg in Biographical Memoirs of Fellows of the Royal Society, 2000, 46, 527. At Cambridge, Todd and his colleagues began using paper chromotography in the early 1950s to separate a mixture of vitamin B12 reaction products as a method to identify them. A lazy part of us is like a tumbleweed. It doesn’t move on its own. Sometimes it takes a lot of Depression to get tumbleweeds moving. In 'Bad People', Morning Poems (2009), 11. A little knowledge is dangerous. So is a lot. 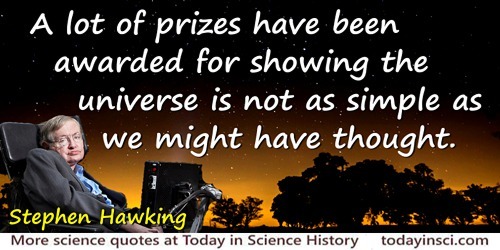 A lot of prizes have been awarded for showing the universe is not as simple as we might have thought. In A Brief History of Time, (1988, 1998), 80. A new cigarette offers coupons good for a cemetery lot. A scientist reads many books in his lifetime, and knows he still has a lot to learn. A religious man barely reads one book, and thinks he knows everything. Astronomy, Benjamin mused, was a lot like a detective story with the clues revealed first, and the actual body only later—if ever. Eater (2000). In Gary Westfahl, Science Fiction Quotations: From the Inner Mind to the Outer Limits (2006), 323. Doctors think a lot of patients are cured who have simply quit in disgust. Don’t despise empiric truth. Lots of things work in practice for which the laboratory has never found proof. Every honest researcher I know admits he’s just a professional amateur. He’s doing whatever he’s doing for the first time. That makes him an amateur. He has sense enough to know that he’s going to have a lot of trouble, so that makes him a professional. Everywhere in science the talk is of winners, patents, pressures, money, no money, the rat race, the lot; things that are so completely alien ... that I no longer know whether I can be classified as a modern scientist or as an example of a beast on the way to extinction. An Imagined World: A Story of Scientific Discovery (1981), 213. Quoted in Evelyn Fox Keller, A Feeling for the Organism: The Life and Work of Barbara McClintock (1984), 207. Fun years for me, for a guy who used to like to blow up things. We had lots of explosions, lots of blowups. Recalling his experience as an engineer at the Propulsion Systems Laboratory. From Interview (1 Sep 2009), for the NASA Glenn History Collection, Oral History Collection, Cleveland, Ohio. As quoted an cited in Robert S. Arrighi, Pursuit of Power: NASA’s Propulsion and Systems Laboratory No. 1 and 2 (2012), 82. I have spent some months in England, have seen an awful lot and learned little. England is not a land of science, there is only a widely practised dilettantism, the chemists are ashamed to call themselves chemists because the pharmacists, who are despised, have assumed this name. Liebig to Berzelius, 26 Nov 1837. Quoted in J. Carriere (ed. ), Berzelius und Liebig. ; ihre Briefe (1898), 134. Trans. W. H. Brock. I just had a romance that I really care about, a lot—I mean, a lot—go up in smoke. Because of the stress, and the sort of other woman that Macintosh is. Jobs blamed his obsession with work at Apple on the soon-to-be-released Macintosh for a breakup. Interview with Rolling Stone writer, Steven Levy (late Nov 1983). As quoted in Nick Bilton, 'The 30-Year-Old Macintosh and a Lost Conversation With Steve Jobs' (24 Jan 2014), on New York Times blog web page. Levy appended a transcript of the interview to an updated Kindle version of his book, Insanely Great: The Life and Times of Macintosh, the Computer that Changed Everything. I like to handle babies. You can learn a lot from the way they respond, the way they slide down your hips, the way they trust you. The first thing a child must learn is to trust. As quoted in Frances Glennon, 'Student and Teacher of Human Ways', Life (14 Sep 1959), 144. From poem, 'Cancer’s a Funny Thing', New Statesman (21 Feb 1964). He is describing experience with his own colostomy. The Cherry Orchard (1904), Act 1. Trans. Elisaveta Fen. If you have a lot of loose papers to carry, or sticks of kindling-wood, you will do it more easily if they are tied together in a single bundle. That is what the scientist is always doing, tying up fugitive facts into compact and portable packages. In a lot of scientists, the ratio of wonder to skepticism declines in time. That may be connected with the fact that in some fields—mathematics, physics, some others—the great discoveries are almost entirely made by youngsters. Quoted in interview with magazine staff, Psychology Today (Jan 1996). In the beginning the Universe was created. This has made a lot of people very angry and been widely regarded as a bad move. Many races believe it was created by some sort of god, though the Jatravartid people of Viltvodle VI believe that the entire Universe was in fact sneezed out of the nose of a being called the Great Green Arkleseizure. It may sound like a lot of work to keep up with organic chemistry, and it is; however, those who haven't the time to do it become subject to decay in the ability to teach and to contribute to the Science—a sort of first-order process the half-life of which can't be much more than a year or two. Highlights of Organic Chemistry: An Advanced Textbook (1974), 112. It’s better to read first rate science fiction than second rate science—it’s a lot more fun, and no more likely to be wrong. Lecture at Wired 2013 (18 Oct 2013). It’s tempting to go to the throat of the volcano to get the data, because if you do you’re a hero … It’s a battle between your mind and your emotions. If your emotions win out, you can get yourself in a lot of trouble. Quoted by Ron Russell in 'Column One: In pursuit of Deadly Volcanoes', Los Angeles Times (25 Jun 1991), an article about for three scientists that had died in a volcano eruption. I’ve known a lot of famous scientists. But the only one I thought was really a genius was McClintock. Tenth stanza of poem 'On Turning 70'. The poem is printed in Michigan Office of Services to the Aging, Annual Report 2004 (2005), no page number. On J-Day our profession will have a lot to answer for! We might at least have withheld our hands instead of making them work against God. Our ultimate analysis of space leads us not to a “here” and a “there,” but to an extension such as that which relates “here” and “there.” To put the conclusion rather crudely—space is not a lot of points close together; it is a lot of distances interlocked. The Mathematical Theory of Relativity (1923), 10. Quantum mechanics is certainly imposing. But an inner voice tells me that this is not yet the real thing. The theory says a lot, but does not bring us any closer to the secrets of the “Old One.” I, at any rate, am convinced that He is not playing at dice. 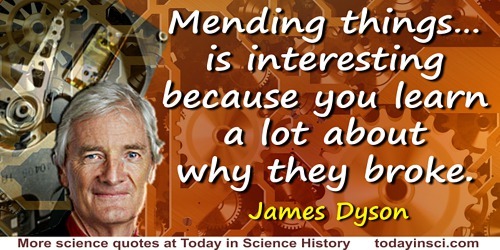 Science was constructed against a lot of nonsense. As quoted in James Gleick, Chaos: Making a New Science (1988), 195. Lilless McPherson Shilling and Linda K. Fuller, Dictionary of Quotations in Communications (1997), 112. Although widely quoted in these words, Webmaster has not yet found the primary source. If you know the primary source, please contact Webmaster. The dangers of atomic war are underrated. It would be hard on little, concentrated countries like England. In the United States, we have lots of space. Chicago Tribune (23 Feb 1950). Their minds sang with the ecstatic knowledge that either what they were doing was completely and utterly and totally impossible or that physics had a lot of catching up to do. So Long, and Thanks for All the Fish (1985). 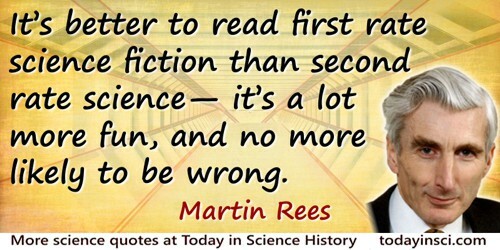 Quoted in Gary Westfahl, Science Fiction Quotations (2005), 322. There’s not a whole lot of new atoms out there. We academic scientists move within a certain sphere, we can go on being useless up to a point, in the confidence that sooner or later some use will be found for our studies. The mathematician, of course, prides himself on being totally useless, but usually turns out to be the most useful of the lot. He finds the solution but he is not interested in what the problem is: sooner or later, someone will find the problem to which his solution is the answer. 'Concluding Remarks', Proceedings of the Royal Society of London, Series A, A Discussion of New Materials, 1964, 282, 152-3. What we’re dealing with is so vast and so global that it really does need to be energized and kicked into high gear. Basically what’s going on is we are overfishing–the biggest danger–there are lots of things going on with the oceans that are threatening them. When he can render no further aid, the physician alone can mourn as a man with his incurable patient. This is the physician's sad lot. As a coach, explaining a player's improved performance. As quoted in William Harmon, The Poetry Toolkit: For Readers and Writers (2012), xi. Why administrators are respected and school-teachers are not: An administrator is paid a lot for doing very little, while a teacher is paid very little for doing a lot. In 'Money Et Cetera', A Voice Crying in the Wilderness (Vox Clamantis in Deserto) (1989), 101. You can learn a lot about ice and still not understand water. Transcribed from video of Four-Day Seminar (1992). Remark to a reporter after the 1963 baseball season. In When You Come to a Fork in the Road, Take It! (2002), 66. [Misattributed] A little knowledge is a dangerous thing. So is a lot. See the original quoted on the page for Alexander Pope, beginning “A little learning …”. [Misquotation? Probably not by Einstein.] 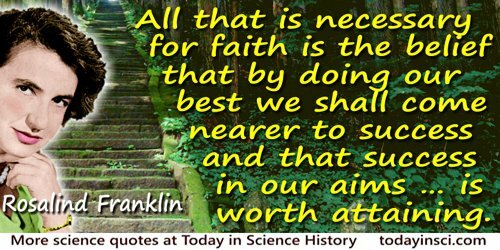 We owe a lot to the Indians, who taught us how to count, without which no worthwhile scientific discovery could have been made. Webmaster doubts that this is a true Albert Einstein quote, having been unable to find it in any major collection of quotations (although it is seen widely quoted) and has been unable to find any source or citation elsewhere. The quote seems of the notable kind that, were it valid, it would have surely have been included in a major collection of Einstein quotes. Nor has it been found attributed to someone else. So, since it is impossible to prove a negative, Webmaster can only caution anyone using this quote that it seems to be an orphan. To provide this warning is the reason it is included here. Neither can it be found attributed to someone else. Otherwise, remember the words of Studs Terkel: “I like quoting Einstein. Know why? Because nobody dares contradict you.” in ‘Voice of America’, The Guardian (1 Mar 2002). If you have knowledge of a primary source, please contact the Webmaster.